How do I login to the BT website? To login to the BT website click on MyBT LOGIN at the top of the page or go to www.bethtfiloh.com/mybt. Enter your user name and password. If this is the first time you have logged in, your temporary password will be your 10 digit home telephone number with no spaces. (Example: 4104861234). Click "SIGN IN" and you will then be prompted to create your own secure password. Alternatively, you may use the "Login Help" and enter your email address. See illustrated instructions. Q. How do I save my username and password in my browser? You can set your browser to save your username and password every time you open a website. Instructions vary for different browsers. Remember to check the "Remember me" box on the login page. Q. What do I do if I forget my login and/or password? If you can’t remember your login/password, click “Login Help”, enter your e-mail address and follow the directions. Your login information will be sent to the e-mail address you have previously given the school. Be sure to keep the Sign In Help window open while you access the Confirmation Key from your e-mail to reset your password. If you are still having difficulty, call our Help Desk at 410-413-2320. Q. Help! - I still can't login, what should I do? If you are having problems logging into the new website using the Sign In Help procedure described above, contact Charlene Schimberg at 410-413-2217 and she will be happy to assist you. To change your email address, go to the MyBT Portal, login, click on your name and click Profile (on the right-hand corner) to review your personal information. Your e-mail address will appear under “Digital”. If necessary, use the pencil edit icon to enter or update your e-mail address. Once it is entered, it will automatically be used for all future e-mail correspondence. Q. How do I update my child's Emergency Contacts? At the beginning of each school year parents will be asked to to confirm and/or update their children's Emergency Information through their MyBT Portal. Download instructions. For technical assistance, please email rchafitz@btfiloh.org. Q. How do I set up e-mail and text messaging notifications? Log in to the MyBT portal, select your name, Settings and Notifications” from the left-hand menu and follow these detailed instructions. Q. How can I avoid having Beth Tfiloh emails ending up in my SPAM folder? Q. Is there a way to search for information I can’t find? A SEARCH tool is available on every page of the website in the top right corner. Q. How can I access the BT website on my mobile phone? You can access a mobile version of the Beth Tfiloh website by using your smartphone's browser and going to www.bethtfiloh.com or www.bethtfiloh.com/mobile. To save the Beth Tfiloh Mobile website on your phone's home screen see the illustrated instructions for iPhones and Android devices. Q. How do I find my child’s homework? In order to view homework assignments for Middle and High School students, go to MyBT >Resources > Academic Portal. Parents and students will also be able to homework assignments with due dates and related information. Also available is Middle/High School students' class schedules, attendance data, emergency contacts and other student information. Q. How do I access the school directory? In order to view the full school directory, go to MyBT > Directory. You must be logged into the website in order to view the Directory. To view an entire grade, select "BT Student" (instead of "All"), click "Advanced Search", select a Grade, and click "Find". Q. How can I find the lunch menu? Information about the Lower School and Upper School lunch programs, including menus and ordering information is available under MyBT > Resources > Lunch Menus. The Upper School lunch menu is also available on the High School and Middle School Calendars. Q. How do I find my child’s group pages? Q. How do I find information about my child’s division (e.g. PreSchool, Lower, Middle or High School)? Q. How do I download photos? To download photos from a photo gallery click on the link to the photo gallery. You will see links to download individual photos, or to download the album. Q. How do I make an online donation? Go to “SUPPORT BT” > “Donate Now” and click on “Donate Now”. 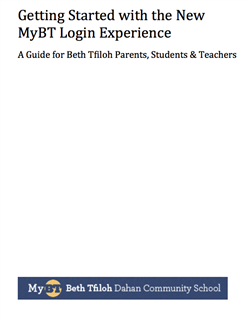 You can also use the MyBT mall Resource page at www.bethtfiloh.com/btmall. Q. How do I find Parent Association information? The Parent Association group page is located under your Groups menu after you login into the MyBT portal. Q. How can I find an athletic team schedule and/or game directions? To view the athletic schedule, go to “SCHOOL LIFE” > “Athletics” > “Athletics Schedule. To view the schedule for a specific team, select the team from the team drop-down box. To obtain directions to an athletic event, go to “SCHOOL LIFE” > “Athletics” > “Directions". Q. How do I find information about an event? Q. How do I register for an event online? Most events will have a link to the corresponding online registration form directly from the calendar under “More Details” link of an event. From the MyBT portal, select Resources and then select BT Mall. A list of all events currently offering for online registration is also available at www.bethtfiloh.com/btmall. Q. There are too many events on the calendar. Can I filter them? • Select on the calendar and check or uncheck the desired categories. • Click at the bottom of the categories. • The Calendar events will also show up if you use the Site Search box located at the top of each page. Q. Can I sync real time Beth Tfiloh events with my personal calendar? Yes! - You can sync any calendar or event categories that show the green rss feed icon in the upper right corner of the calender or event list. This is particularly beneficial for athletic team practice and game schedules. Q. How do I sync a BT calendar to my Google calendar? 1) Go to the BT calendar or event list you would like to sync. 2) Click the green rss feed icon on the top right corner of the BT calendar/event list to open it. 3) Highlight the entire feed URL that is listed and right click to copy the URL. 5) On the bottom left side of your Google calendar under Other calendars, click the add button. 6) Choose add by URL. 7) Paste the previously copied BT feed URL into the open URL Box. Click Add Calendar. You should now see the real time updated BT calendar on your Google Calendar. Q. How do I sync a calendar from the BT website to my iCal compatible calendar? 4) Open your iCal application calendar. 5) Paste the previously copied BT feed URL into your iCal calendar. You should now see the real time updated BT calendar on your iCal Calendar. The Beth Tfiloh Mobile website provides access to useful information in a mobile-friendly format. View instructions.